If Ted Cruz had given a less encrypted endorsement about the no-brainer vote non-liberals should eagerly make in November, men who still identify as men would have to question Cruz’s manhood today. Yea, that’s right. 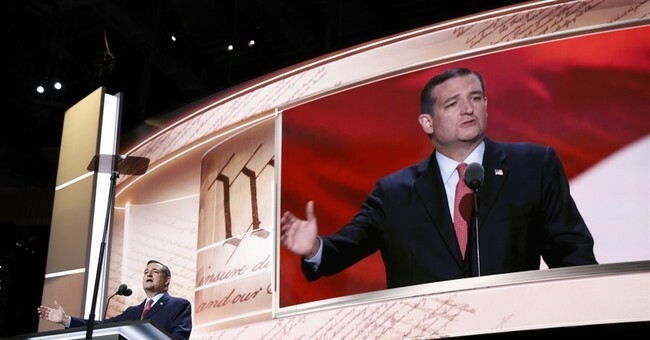 Only men with low testosterone could have a problem with the dignified and conservative endorsement Cruz offered Wednesday night to his adversary at the GOP Convention. How Cruz summoned the self-discipline not to punch Donald Trump in the face after what Trump said about Cruz’s wife and father was nothing short of super-human and classy. Perhaps if Cruz had served in the Marine Corps, he might have known what to do when Trump took up position in the gutter and started insulting Cruz’s family. But alas, Cruz is among the 87 percent of men in America who have passed on taking the oath to literally defend the Constitution with their lives. That, however, is about the only similarity Cruz and Donald Trump share. None of us has seen GOP amnesty lover John McCain endorse Trump. And for everything there is to dislike about John McCain, two things we can respect about the guy is that McCain is not a wimp, and he’s not afraid to throw a punch. But unlike Ted Cruz, no one has ever accused John McCain of being brilliant, dignified, or classy. And unlike Cruz’s enemies, no one is complaining about John McCain’s arrogant refusal to endorse Trump after what Trump said about McCain’s military service. On the other hand, Cruz showed respect and honor for his wife and his father by refusing to kiss Trump’s rear end. However, Cruz still managed to be gracious to the GOP nominee. Who cares what Trump and his rabid supporters wanted and tried to coerce Cruz to do. For those who lack the mental capacity to comprehend that Cruz said the vote is basically a no brainer, all Cruz can do is encourage them to get over it. Yes, tonight I will encourage all my supporters to swallow their pride, just as I will do. It’s time we rally behind my liberal friend, Dirty Donald Trump. My fellow Americans, we share a common enemy, and her name is Hillary Clinton. Donald Trump -- At least he's not ashamed of being an American! Donald Trump -- At least he doesn't want to destroy our military! Donald Trump -- At least he's not a communist mole! Donald Trump -- At least he didn't share national secrets with America’s enemies! Donald Trump -- At least he didn't blame the muslim-terrorist attack in Benghazi on a video! Donald Trump -- At least he’s not covering up the traitorous plot of our current administration and the Democratic Party! Donald Trump -- At least he didn't claim to dodge imaginary bullets of an incompetent sniper in Bosnia! Donald Trump -- At least he didn't get filthy rich working for the government! Donald Trump -- At least he’s despised by the liberal media and the Washington Cartel! Donald Trump -- At least his beautiful wife is proud to be an American! Donald Trump -- At least he doesn't want to be the NYC liberal that he is! Donald Trump — At least he isn’t Hillary Clinton! Granted by this point, the rabid Trump disciples would have been booing Cruz off the stage just as they did when his endorsement was not quite as straight forward. However, Cruz would have still gotten his eloquent conservative point across, accomplished his mission, and given a bolder endorsement of the GOP nominee. Cruz would have courageously taken one for the team -- just like all his supporters should do, too. Then again, maybe he did. Maybe it is all part of the show. Regardless, Cruz’s enemies can go on hating him all they want. Let their pride and anger blind them to the truth and the facts. For everything I dislike about Trump supporters, they are probably right about one thing: Hillary Clinton is worse than Donald Trump. Even Ted Cruz said as much in his inferred endorsement Wednesday night. It’s time to swallow one’s pride. Brave Americans have fought and died for our right to vote. Don’t waste your vote. And don’t throw it away on the libertarian, wanna-be hippy who doesn’t stand a chance of winning. Maybe Cruz should have just said that anyone who doesn’t vote against Hillary Clinton simply has no conscience -- only foolish pride.